Kim Kardashian shared this cute video of her two-year-old daughter, North West telling her she’s scared of Snapchat on Thursday. ‘Snapchat. 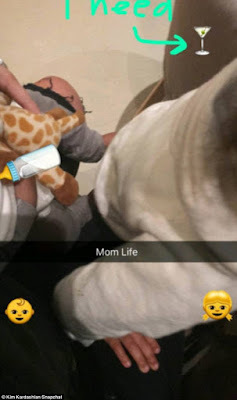 I’m scared of Snapchat,’ North is heard saying as she rests a hand on her mom’s arm. ‘You’re scared of Snapchat? Why?’ asks a concerned Kim, before realizing ‘Oh, the filters with the crazy faces.’ ‘Not a Snap fan,’ Kim wrote, adding an arrow pointing to North.